When editing text in the Multi-Channel Text Editor of Content Station, an efficient way of applying character styles and paragraph styles is by using keyboard shortcuts. 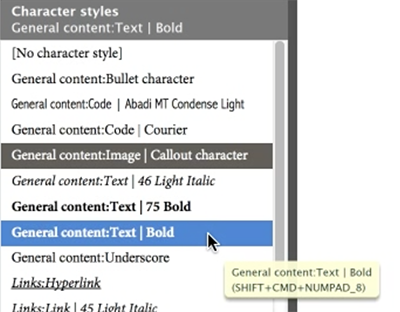 Setting up keyboard shortcuts for character styles and paragraph styles needs to be done in either InDesign or InCopy; it cannot be done in Content Station itself. Step 1. Create a new article in InDesign or InCopy or open an existing one. For InCopy see Opening articles in InCopy using Smart Connection. Step 2. In the Options window for a character style or paragraph style, define a keyboard shortcut. Note: You are restricted to using any combination of Shift, Alt, and Ctrl (Windows), or Shift, Option, and Command (Mac OS), and press a number on the numeric keypad. You cannot use letters or non-keypad numbers for defining style shortcuts. If your keyboard does not have a Num Lock key, you cannot add keyboard shortcuts to styles. Step 3. Click OK to close the Options window. Step 4. Check-in the article. When opening the article in Content Station, the saved keyboard shortcuts are now available. To see which character styles and which paragraph styles have keyboard shortcuts assigned, hover your mouse over a style in the Style pane of the Multi-Channel Text Editor in Content Station. The keyboard shortcut is displayed in the tooltip that appears.